IT Solutions Recognized as a 2014 Best Place to Work by Philadelphia Business Journal and custom application development services and looks forward to similar success in years to come. "At IT Solutions we understand that our employees are the backbone to our success," said Ted Swanson, CEO of IT Solutions. "In order to provide the best client support and continue to grow, it’s critical that we maintain a work environment where our staff can thrive." "This is a huge achievement for us because it allows us to further distinguish ourselves from the competition and continue to attract the best talent out there," Swanson said. Philadelphia Business Journal’s research partner, Quantum Workplace, tabulated the results of thousands of online surveys completed by employees to establish the rank order that will be revealed for the very first time at the award ceremony. Common themes among top companies focused on work-life balance; respect and caring for employees; recognition of accomplishments; feeling empowered; good teamwork and commitment to community. The region’s top companies will be recognized for the first time on Thursday morning, Oct. 9, 2014 at the Sonesta Philadelphia Hotel, 1800 Market Street, Philadelphia, PA. The event will gather executives from influential companies in the Philadelphia region for a morning of networking, a keynote presentation, and an exciting award ceremony. Event tickets are available for $75. To purchase tickets visit: http://tinyurl.com/2014pbjbestplaces. IT Solutions and fellow winners will be profiled in a special section of the Philadelphia Business Journal’s October 10th issue. 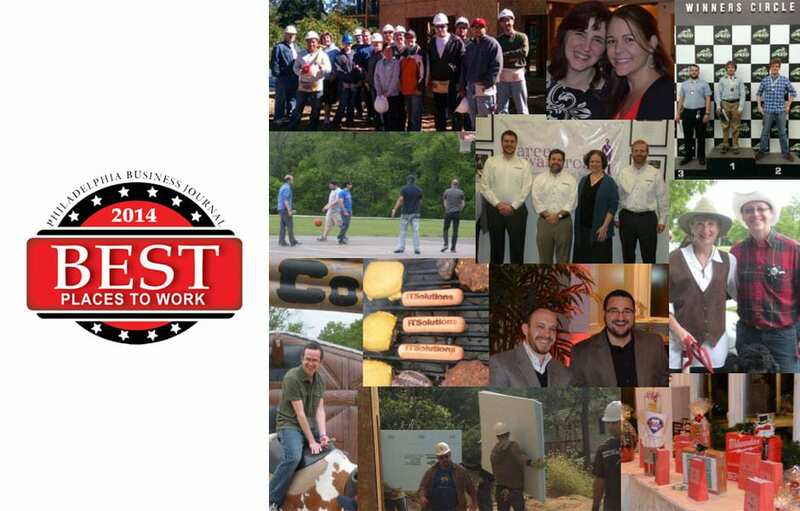 IT Solutions is proud to announce that we've been honored as a 2014 Best Places to Work award recipient by the Philadelphia Business Journal. IT Solutions has been providing full-service technology solutions to businesses across the Philadelphia and Mid-Atlantic region since 1994. The company has seen steady growth over the last decade with its process-driven managed network support and custom application development services and looks forward to similar success in years to come.